ĐỒNG NAI — The property market is booming in the southern province of Đồng Nai of thanks to its excellent infrastructure. The local Department of Construction said 250 property projects were developed recently, 15 by foreign investors and involving a minimum investment of US$10 million. Some that had stalled in 2008 have been revived, it said. Land and "ecological" villas are the most popular developments, especially near the proposed Long Thành International Airport. The projects here include Thác Giang Điền (Giang Điền Fall) Resort, Sakura ecological urban area targeted at expats and The ViVa, another urban area. 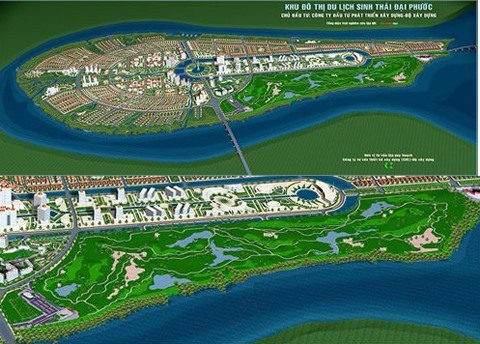 Trí Thức Trẻ newspaper reported that LDG company planned to develop several projects on a combined area of 150ha, including Premium Eco Village, Diamond Valley, EcoLife Village, and expand Suối Mơ Tourism Area. This year the company will also begin construction of The Viva Square, a shopping mall. Other developers like Kim Oanh and EximRS plan to continue investing in the province. Last year Kim Oanh developed RichLand City and EximRS Company was a seller of the Long Hưng urban area project. Amata Group is completing procedures for two projects in Long Thành District. In Long Hưng District, an urban area called Waterfront will be developed jointly by Vietnamese and Singaporean investors at a cost of $750 million. VinaCapital Group and DIC have resumed the 200ha, $400 million Hoa Sen Đại Phước project in Nhơn Trạch District. The booming market has also sparked off M&A deals. Thành Thành Công Group, for instance, has bought a 35 per cent stake in Tín Nghĩa Company, one of the biggest real estate players in the province. With the market gathering momentum, prices are rising. Brokers said the prices of land and houses in Biên Hoà City and the districts of Long Thành, Nhơn Trạch and Vĩnh Cửu had risen by 10-20 per cent depending on how close they were to the developing infrastructure. Developers expect prices in places close to infrastructure construction to keep increasing. Furthermore, the economy has been recovering for the past two years and bank interest rates are steady, meaning demand for property is rising quickly, they said. Nguyễn Thành Lâm, chairman of the Đồng Nai Property Association, said the market in Biên Hoà, Trảng Bom, Long Thành, Nhơn Trạch would continue to boom through this year. The Đồng Nai property market got a boost with the construction of the HCM City – Long Thành – Dầu Giây Highway, which has cut the distance to the south-eastern provinces. Besides, National Highway 1A connecting Đồng Nai with HCM City has been widened. In 2015 the market began to react to the information that Long Thành International Airport will be developed, and it was approved last year.